This is a scalable context timeline. It contains events related to the event October 7, 2001: ISI Director Replaced at US Urging; Role in Funding 9/11 Plot Is One Explanation. You can narrow or broaden the context of this timeline by adjusting the zoom level. The lower the scale, the more relevant the items on average will be, while the higher the scale, the less relevant the items, on average, will be. Pakistani President Pervez Musharraf meets with Hamid Gul, former head of the ISI, Pakistan’s intelligence agency, according to a 2002 report in the New Yorker. The meeting is said to take place this evening at ISI headquarters. Gul has just returned from Northern Afghanistan. This information is according to Mohammad Qasim Fahim, the defense minister in Afghanistan’s government at the time of the 2002 New Yorker article. Also on this day, Ahmed Shah Massoud, top leader of the Northern Alliance, is assassinated (see September 9, 2001). Fahim is Massoud’s second in command, and takes over leadership of the Northern Alliance. At this time, Pakistan is supporting the Taliban, who are fighting the Northern Alliance. An intelligence officer “close to Massoud” will tell the New Yorker that Musharraf and Gul are at ISI headquarters for a party to celebrate Massoud’s death. While Fahim alleges Musharraf and Gul are there, he will only say “maybe” there is a party. [New Yorker, 6/10/2002] The Northern Alliance will claim that the ISI and al-Qaeda are behind Massoud’s assassination (see September 10, 2001). Gul retired from the ISI in 1989 (see April 1987), but there are allegations that he has continued to actively support Islamist militants ever since (see December 7, 2008 and July 26, 2010). In 2004, UPI will report allegations that he was a central figure in the 9/11 plot (see July 22, 2004). There will also be claims that the head of the ISI at the time of 9/11, Lieutenant General Mahmood Ahmed, helped fund some of the 9/11 hijackers (see October 7, 2001). The on-line Wall Street Journal article discussing the connections between Lt. Gen. Mahmood Ahmed, Saeed Sheikh, and Mohamed Atta. 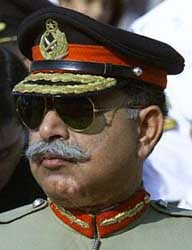 [Source: Public domain]ISI Director Lt. Gen. Mahmood Ahmed is replaced in the face of US pressure after links are discovered between him, Saeed Sheikh, and the funding of the 9/11 attacks. Mahmood instructed Saeed to transfer $100,000 into hijacker Mohamed Atta’s bank account prior to 9/11. This is according to Indian intelligence, which claims the FBI has privately confirmed the story. [Press Trust of India, 10/8/2001; Times of India, 10/9/2001; India Today, 10/15/2001; Daily Excelsior (Jammu), 10/18/2001] The story is not widely reported in Western countries, though it makes the Wall Street Journal. [Australian, 10/10/2001; Agence France-Presse, 10/10/2001; Wall Street Journal, 10/10/2001] It is reported in Pakistan as well. [Dawn (Karachi), 10/8/2001] The Northern Alliance also repeats the claim in late October. [Federal News Service, 10/31/2001] In Western countries, the usual explanation is that Mahmood is fired for being too close to the Taliban. [London Times, 10/9/2001; Guardian, 10/9/2001] The Times of India reports that Indian intelligence helped the FBI discover the link, and says, “A direct link between the ISI and the WTC attack could have enormous repercussions. The US cannot but suspect whether or not there were other senior Pakistani Army commanders who were in the know of things. Evidence of a larger conspiracy could shake US confidence in Pakistan’s ability to participate in the anti-terrorism coalition.” [Times of India, 10/9/2001] There is evidence some ISI officers may have known of a plan to destroy the WTC as early as July 1999. Two other ISI leaders, Lt. Gen. Mohammed Aziz Khan and Lt. Gen. Muzaffar Usmani, are sidelined on the same day as Mahmood (see October 8, 2001). [Fox News, 10/8/2001] Saeed had been working under Khan. The firings are said to have purged the ISI of its fundamentalists. However, according to one diplomat, “To remove the top two or three doesn’t matter at all. The philosophy remains.… [The ISI is] a parallel government of its own. 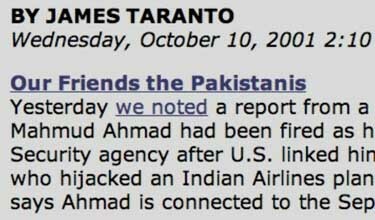 If you go through the officer list, almost all of the ISI regulars would say, of the Taliban, ‘They are my boys.’” [New Yorker, 10/29/2001] It is believed Mahmood has been living under virtual house arrest in Pakistan (which would seem to imply more than just a difference of opinion over the Taliban), but no charges have been brought against him, and there is no evidence the US has asked to question him. [Asia Times, 1/5/2002] He also has refused to speak to reporters since being fired [Associated Press, 2/21/2002] , and outside India and Pakistan, the story has only been mentioned infrequently in the media since. [Sunday Herald (Glasgow), 2/24/2002; London Times, 4/21/2002] He will reemerge as a businessman in 2003, but still will not speak to the media (see July 2003).